Leonie is a freelance chef and food writer, with a particular passion for building confidence in girls. At our Food, Coding, Weekend on 8th October hosted by Bank of America Merrill Lynch, she was also a ‘hackathon first-timer’. Find her at www.curatedcakes.com or @gossbowl on Twitter. To a soundtrack of upbeat pop music, a stream of girls arrived at the ‘Food, Coding, Weekend’ hackathon last Saturday. The tone was set in signature Stemettes style: fun, informal and full of energy. At the centre of the buzz was, of course, founder Anne-Marie: she kicked things off with all the dynamism that makes a Stemette event so effective. Plunging the girls into raucous ‘ice-breaker’ games, it was clear that this weekend wouldn’t be a quiet affair. Stemettes crashes through multitudes of coding stereotypes with its work, and the idea of techy introverts is left firmly at the door. This hackathon was as much about food and fun as solving the coding tasks at hand. 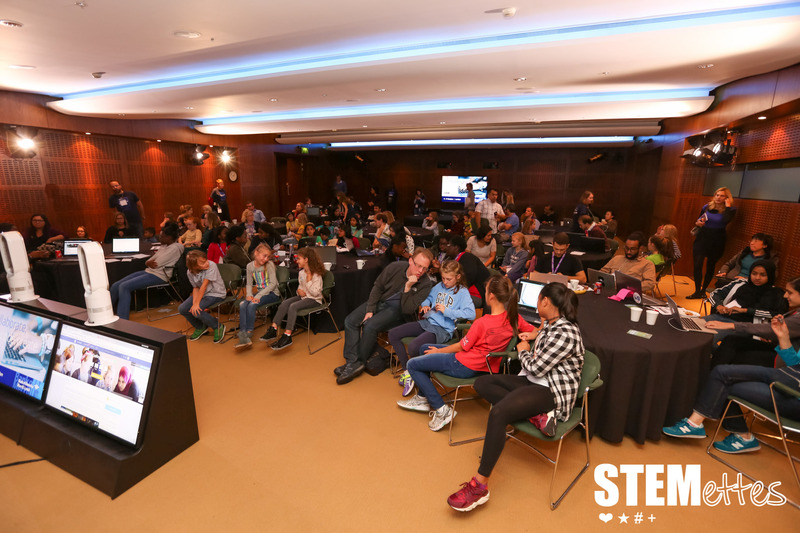 Because at the heart of Stemettes – evident in every detail of the event – is the crucial goal of getting girls engaged, giving them the space to relax and be brave with their ideas. The rounds of selfies, party playlist and the lightbox (complete with inspiring slogans) were as key as the laptops each girl was working on. But under the fun, there were certainly some serious themes to tackle . . .For the past three months, Stemettes had been working with the Bank of America Merrill Lynch on their latest hackathon weekend. I spoke to Jana, the driving force behind the weekend’s topic: solving food waste. Passionate about the subject of world hunger, she explained why this subject was particularly fitting for a Stemettes audience: not only does global hunger disproportionately affect girls, but she felt that a healthy understanding of food issues was part of inspiring a healthy personal relationship with food too. For a company that keeps food at the core of all its events, it was an inspired concept. And a great choice for Stemettes, which prides itself on its ability to draw in girls without resorting to the clichés of gender specific themes. Unsurprisingly, the girls didn’t disappoint. They were quickly thinking round the topic, posing solutions that touched on a wide variety of areas. From the starting point of food distribution, they spiraled into the opportunities offered at both ends of the food chain: the restaurant industry, homelessness and the possibilities that exist between commercial and charitable organisations. And while this does all sound impressive, that’s not to lose sight of a central Stemettes hackathon mantra: total inclusiveness. From 5 year olds to GCSE students, first-time coders to proficient Pythoners – it simply doesn’t matter why you’re there or what you know. With friendly teachers at all levels, getting stuck in to whatever grabs you seems the simple name of the game. As one Stemette put it, public events like these seem to bring out the best of the company. They give free reign to its uniqueness – the noisy, bold and entertaining spirit with which it tackles very real problems. No wonder it was sold out, both for volunteers and attendees. Photos from the event are up on our Flickr page. A huge thank you to our event partners Bank of America Merrill Lynch, Hackerearth and O2 Think Big for ensuring this was a success. You can find out more upcoming events on the Stemettes website or in our OtotheB app.